Note: This manifold includes two extra 1/8" NPT plugs. The manifold comes with two 1/8" NPT ports tapped in the back of it. These are vacuum / boost ports that can be used for a boost gauge, boost reference power valves, or any other items that need to be connected to a boost / vacuum source. If the ports are not needed, use the included plugs to block them off. These Weiand manifolds are available for the small block Chevy, big block Chevy and Chrysler applications to work with Weiand superchargers. Weiand's design also allows the use of OE style water outlets with the pop-off plate mounted at the rear of the manifold. 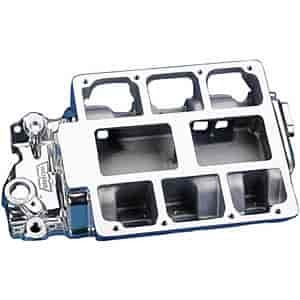 The SB-Chevy manifold will not fit 1993 and later LT1 heads and may require slight elongation of the four center manifold mounting holes for installation on some late model cylinder heads. Available in satin or polished aluminum. Does Weiand 7136P fit your vehicle?